U.S. News & World Report is an American media company that publishes news, opinion, consumer advice, rankings, and analysis. Founded as a newsweekly magazine in 1933, U.S. News transitioned to primarily web-based publishing in 2010. U.S. News is best known today for its influential Best Colleges and Best Hospitals rankings, but it has expanded its content and product offerings in education, health, money, careers, travel, and cars. The rankings are popular in North America but have drawn widespread criticism from colleges, administrations, and students for their dubious, disparate, and arbitrary nature. The ranking system by U.S. News is usually contrasted with the Washington Monthly and Forbes rankings. United States News was founded in 1933 by David Lawrence (1888–1973), who also started World Report in 1946. The two magazines covered national and international news separately, but Lawrence merged them into U.S. News & World Report in 1948. He subsequently sold the magazine to his employees. Historically, the magazine tended to be slightly more conservative than its two primary competitors, Time and Newsweek, and focused more on economic, health, and education stories. It also eschewed sports, entertainment, and celebrity news. Important milestones in the early history of the magazine include the introduction of the "Washington Whispers" column in 1934 and the "News You Can Use" column in 1952. In 1958, the weekly magazine's circulation passed one million and reached two million by 1973. Since 1983, it has become known primarily for its influential ranking and annual reports of colleges and graduate schools, spanning across most fields and subjects. U.S. News & World Report is America's oldest and best-known ranker of academic institutions, and covers the fields of business, law, medicine, engineering, education, social sciences and public affairs, in addition to many other areas. Its print edition was consistently included in national bestseller lists, augmented by online subscriptions. Additional rankings published by U.S. News & World Report include hospitals, medical specialties and automobiles. In October 1984, publisher and real estate developer Mortimer Zuckerman purchased U.S. News & World Report. Zuckerman is also formerly the owner of the New York Daily News. In 1993, U.S. News & World Report entered the digital world by providing content to CompuServe and in 1995, the website usnews.com was launched. In 2001, the website won the National Magazine Award for General Excellence Online. In 2007, U.S. News & World Report published its first list of the nation's best high schools. Its ranking methodology includes state test scores and the success of poor and minority students on these exams, and schools' performance in Advanced Placement exams. Starting in June 2008, the magazine reduced its publication frequency in three steps. In June 2008, citing the decline overall magazine circulation and advertising, U.S. News & World Report announced that it would become a biweekly publication, starting January 2009. It hoped advertisers would be attracted to the schedule, which allowed ads to stay on newsstands a week longer. However, five months later the magazine changed its frequency again, becoming monthly. In August 2008, U.S. News expanded and revamped its online opinion section. The new version of the opinion page included daily new op-ed content as well as the new Thomas Jefferson Street blog. An internal memo was sent on November 5, 2010, to the staff of the magazine informing them that the "December issue will be our last print monthly sent to subscribers, whose remaining print and digital replica subscriptions will be filled by other publishers." The memo went on to say that the publication would be moving to a primarily digital format but that it would continue to print special issues such as "the college and grad guides, as well as hospital and personal finance guides." Prior to going defunct, U.S. News was the lowest-ranking news magazine in the U.S., after Time and Newsweek. A weekly digital magazine, U.S. News Weekly, introduced in January 2009, continued to offer subscription content until it ceased at the end of April 2015. The company is owned by U.S. News & World Report, L.P., a privately held company based in the Daily News building in New York City. The editorial staff is headquartered in Washington, D.C. The company's move to the Web made it possible for U.S. News & World Report to expand its service journalism with the introduction of several consumer-facing rankings products. The company returned to profitability in 2013. The editorial staff of U.S. News & World Report is based in Washington, D.C. and Brian Kelly has been the chief content officer since April 2007. The company is owned by media proprietor Mortimer Zuckerman. The first of the U.S. News & World Report's famous rankings was its "Who Runs America?" surveys. These ran in the spring of each year from 1974 to 1986. The magazine would have a cover typically featuring persons selected by the USN & WR as being the ten most powerful persons in the United States. Every single edition of the series listed the President of the United States as the most powerful person, but the #2 position included such persons as Secretary of State Henry Kissinger (1974), Federal Reserve Chairmen Paul Volcker and Arthur Burns (each listed multiple years) and US Senator Edward Kennedy (1979). While most of the top ten each year were officials in government, occasionally others were included, including TV anchormen Walter Cronkite and Dan Rather, Chase Manhattan Bank Chairman David Rockefeller, AFL-CIO leader George Meany, and consumer advocate Ralph Nader. The only woman to make the top ten list was First Lady Rosalynn Carter in 1980. In addition to these overall top ten persons, the publication also included top persons in each of several fields, including Education, Business, Finance, Journalism, and many other areas. The survey was discontinued after 1986. In 1983, U.S. News & World Report published its first "America's Best Colleges" report. The rankings have been compiled and published annually since 1987. These rankings are based upon data that U.S. News & World Report collects from each educational institution from an annual survey sent to each school. The rankings are also based upon opinion surveys of university faculties and administrators who do not belong to the schools. In addition to colleges, U.S. News & World Report also ranks graduate schools and academic programs in a number of specific disciplines, including business, law, engineering, nursing, and medicine. The popularity of U.S. News & World Report's Best Colleges rankings is reflected in its 2014 release, which brought 2.6 million unique visitors and 18.9 million page views to usnews.com in one day. Traffic came from over 3,000 sites, including Facebook and Google. 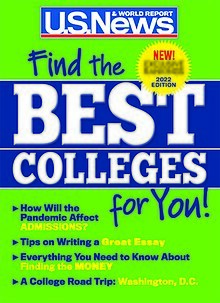 U.S. News & World Report continues to publish comprehensive college guides in book form. Robert Morse created the U.S. News Best Colleges rankings methodology, and continues to oversee its application as chief data strategist at U.S. News. In 2014, The Washington Post featured a profile of Morse, exploring his 30-year career with the publication. During the 1990s, several educational institutions in the United States were involved in a movement to boycott the U.S. News & World Report college rankings survey. The first was Reed College, which stopped submitting the survey in 1995. The survey was also criticized by Alma College, Stanford University, and St. John's College during the late 1990s. SAT scores play a role in The U.S. News & World Report college rankings even though U.S. News is not empowered with the ability to formally verify or recalculate the scores that are represented to them by schools. Since the mid-1990s there have been many instances documented by the popular press wherein schools lied about their SAT scores in order to obtain a higher ranking. An exposé in the San Francisco Chronicle stated that the elements in the methodology of U.S News & World Report's rankings are redundant and can be reduced to one thing: money. On June 19, 2007, during the annual meeting of the Annapolis Group, members discussed the letter to college presidents asking them not to participate in the "reputation survey" section of the U.S. News & World Report survey (this section comprises 25% of the ranking). As a result, "a majority of the approximately 80 presidents at the meeting said that they did not intend to participate in the U.S. News reputational rankings in the future." The statement also said that its members "have agreed to participate in the development of an alternative common format that presents information about their colleges for students and their families to use in the college search process." This database will be web-based and developed in conjunction with higher-education organizations including the National Association of Independent Colleges and Universities (NAICU) and the Council of Independent Colleges. On June 22, 2007, U.S. News & World Report editor Robert Morse issued a response in which he argued, "in terms of the peer assessment survey, we at U.S. News firmly believe the survey has significant value because it allows us to measure the 'intangibles' of a college that we can't measure through statistical data. Plus, the reputation of a school can help get that all-important first job and plays a key part in which grad school someone will be able to get into. The peer survey is by nature subjective, but the technique of asking industry leaders to rate their competitors is a commonly accepted practice. The results from the peer survey also can act to level the playing field between private and public colleges." In reference to the alternative database discussed by the Annapolis Group, Morse also argued, "It's important to point out that the Annapolis Group's stated goal of presenting college data in a common format has been tried before [...] U.S. News has been supplying this exact college information for many years already. And it appears that NAICU will be doing it with significantly less comparability and functionality. U.S. News first collects all these data (using an agreed-upon set of definitions from the Common Data Set). Then we post the data on our website in easily accessible, comparable tables. In other words, the Annapolis Group and the others in the NAICU initiative actually are following the lead of U.S. News." Some higher education experts, such as Kevin Carey of Education Sector, have asserted that U.S. News & World Report's college rankings system is merely a list of criteria that mirrors the superficial characteristics of elite colleges and universities. According to Carey, the U.S. News ranking system is deeply flawed. Instead of focusing on the fundamental issues of how well colleges and universities educate their students and how well they prepare them to be successful after college, the magazine's rankings are almost entirely a function of three factors: fame, wealth, and exclusivity. He suggests that there are more important characteristics parents and students should research to select colleges, such as how well students are learning and how likely students are to earn a degree. The question of college rankings and their impact on admissions gained greater attention in March 2007, when Dr. Michele Tolela Myers (the former President of Sarah Lawrence College) shared in an op-ed that the U.S. News & World Report, when not given SAT scores for a university, chooses to simply rank the college with an invented SAT score of approximately one standard deviation (roughly 200 SAT points) behind those of peer colleges, with the reasoning being that SAT-optional universities will, because of their test-optional nature, accept higher numbers of less academically capable students. In the U.S. News worldview of college quality, it matters not a bit what students actually learn on campus, or how a college actually contributes to the intellectual, ethical and personal growth of students while on campus, or how that institution contributes to the public good [...] and then, when you consider that student SAT scores are profoundly correlated [to] parental income and education levels – the social class that a child is born into and grows up with – you begin to understand what a corrupt emperor 'America's Best Colleges' really is. The ranking amounts to little more than a pseudo-scientific and yet popularly legitimate tool for perpetuating inequality between educational haves and have nots – the rich families from the poor ones, and the well-endowed schools from the poorly endowed ones. In October 2014, the U.S. News & World Report published its inaugural "Best Global Universities" rankings. Inside Higher Ed noted that the U.S. News is entering into the international college and university rankings area that is already "dominated by three major global university rankings," namely the Times Higher Education World University Rankings, the Academic Ranking of World Universities, and the QS World University Rankings. Robert Morse stated that "it's natural for U.S. News to get into this space." Morse also noted that the U.S. News "will also be the first American publisher to enter the global rankings space." Since 1990, U.S. News & World Report has compiled the Best Hospitals rankings. The Best Hospitals rankings are specifically based on a different methodology that looks at difficult (high acuity) cases within 16 specialties, including cancer; diabetes and endocrinology; ear, nose and throat; gastroenterology; geriatrics; gynecology; heart and heart surgery; kidney disorders; neurology and neurosurgery; ophthalmology; orthopedics; psychiatry; pulmonology; rehabilitation; rheumatology; and urology. In addition to rankings for each of these specialties, hospitals that excel in many U.S. News areas are ranked in the Honor Roll. Since 2007, U.S. News has developed an innovative rankings system for new and used automobiles. The rankings span over 30 classes of cars, trucks, SUVs, minivans, wagons, and sports cars. Each automobile receives an overall score, as well as a performance, interior, and recommendation score to the nearest tenth on a 1-10 scale. Scores are based on the consensus opinion of America's trusted automotive experts, as well as reliability and safety data. U.S. News also produces annual "Best Cars for the Money" and "Best Cars for Families" awards across approximately 20 classes of cars, trucks, SUVs, and minivans. Money award winners are derived by combining vehicle price and five-year cost of ownership with the opinion of the automotive press, while family awards are tabulated by combining critics' opinions with the vehicle's availability of family-friendly features and interior space, as well as safety and reliability data. Money and family award winners are announced in February and March of each year, respectively. In 2017, U.S. News published its first ranking of all 50 U.S. states, incorporating metrics in seven categories: health care, education, crime and corrections, infrastructure, opportunity, economy, and government. The weighting of the individual categories in determining overall rank was informed by surveys on what matters most to residents. Massachusetts occupies the top rank of the 2017 list, with an overall #2 ranking in health care and #1 ranking in education. ^ David E. Sumner (May 2012). "American winners and losers:2001 to 2010" (PDF). International Conference on Communication, Media, Technology and Design. Istanbul. Retrieved June 25, 2016. ^ "U.S. News & World Report". Encyclopædia Britannica. 2008. Retrieved June 24, 2008. ^ a b c "About U.S. News & World Report". Retrieved July 6, 2017. ^ "U.S. News college rankings are denounced but not ignored". The Washington Post. The Washington Post Company. 2011. Retrieved September 4, 2011. ^ "U.S. News & World Report: Comprehensive Categories of Academic Institutions". U.S. News & World Report. U.S. News & World Report, L.P. 2012. Retrieved June 18, 2012. ^ "2001 National Magazine Awards". Infoplease. ^ Pérez-Peña, Richard (June 11, 2008). "U.S. News Plans to Publish Biweekly and Expand Consumer Focus". The New York Times. The New York Times Company. Retrieved June 24, 2008. ^ "Red Ink: 'U.S. News' Goes Monthly, Hearst and Rodale Cut Staff". MediaPost. June 11, 2008. Archived from the original on March 7, 2012. Retrieved June 11, 2008. ^ "Political Blogs, Opinions, Commentaries and Forums on Current Issues". U.S. News & World Report. U.S. News & World Report, L.P. Retrieved July 20, 2014. ^ "Political Blogs, Opinions, Commentaries and Forums on Current Issues". US News. Retrieved June 30, 2013. ^ "'December issue will be our last printed monthly sent to subscribers'". PoytnerOnline. November 5, 2010. Archived from the original on November 6, 2010. Retrieved November 5, 2010. ^ Sacks, Peter (April 5, 2007). "America's Best College Scam". The Huffington Post. AOL. Archived from the original on April 2, 2011. ^ "Value Added: U.S. News & World Report returns to the ranks of profitability". ^ "backissues.com - U.S. News & World Report April 22, 1974 - Product Details". ^ "backissues.com - U.S. News & World Report April 16, 1979 - Product Details". ^ "backissues.com - U.S. News & World Report April 14, 1980 - Product Details". ^ Morse, Robert. "The Birth of the College Rankings". US News. Retrieved 14 April 2017. ^ "Graduate School Rankings". Archived from the original on 2017-02-23. ^ a b "U.S. News Pulls Social Levers to Break Records for 'Best Colleges' Package - min Online". 19 September 2013. Archived from the original on 23 January 2015. ^ "Amazon's listings of U.S. News "College Guides"". Amazon.com. Retrieved 2015-01-17. ^ Leiby, Richard; Leiby, Richard (9 September 2014). "The U.S. News college rankings guru" – via washingtonpost.com. ^ Christopher B. Nelson, "Why you won't find St. John's College ranked in U.S.News & World Report Archived 2007-09-27 at the Wayback Machine", University Business: The Magazine for College and University Administrators. ^ Diver, Colin. "Is There Life After Rankings". The Atlantic. November 1, 2005. ^ Rojstaczer, Stuart (September 3, 2001). "College Rankings are Mostly About Money". San Francisco Chronicle. ^ Jaschik, Scott (20 June 2007). "More Momentum Against 'U.S.News'". Inside Higher Ed. ^ "Annapolis Group Statement on Rankings and Ratings". Annapolis Group. 19 June 2007. ^ a b Morse, Robert (22 June 2007). "About the Annapolis Group's Statement". U.S. News & World Report. Archived from the original on 2 July 2007. ^ Carey, Kevin. "College Rankings Reformed" (PDF). educationsector.org. Archived from the original (PDF) on August 23, 2009. Retrieved July 28, 2009. ^ Tolela Myers, Michele (11 March 2007). "The Cost of Bucking College Rankings". The Washington Post. ^ Sacks, Peter (May 25, 2011). "America's Best College Scam". The Huffington Post. Retrieved April 26, 2016. ^ "Top American Hospitals - US News Best Hospitals". U.S. News & World Report. Retrieved 2014-10-15. ^ Lowes, Robert (2012-09-20). "Joint Commission's Top-Hospital List Still Missing Big Names". Medscape Medical News. ^ Comarow, Avery (2008-07-10). "A Look Inside the Hospital Rankings". U.S. News & World Report. ^ "Top American Hospitals". U.S. News & World Report. 17 July 2012. ^ How We Rank New Cars | U.S. News Best Cars. cars.usnews.com. Retrieved on 2014-04-12. ^ Page, Jamie. (2014-02-12) Best Cars for the Money Awards 2014 | U.S. News Best Cars Archived March 12, 2009, at the Wayback Machine. cars.usnews.com. Retrieved on 2014-04-12. ^ Page, Jamie. (2014-03-12) Best Cars for Families Awards 2014 | U.S. News Best Cars. cars.usnews.com. Retrieved on 2014-04-12. ^ Best States Rankings. U.S. News. Retrieved on 2017-04-06. Wikimedia Commons has media related to Images from U.S. News & World Report.